A 90-year-old tortoise is going twice its normal speed after being fitted with a set of wheels. 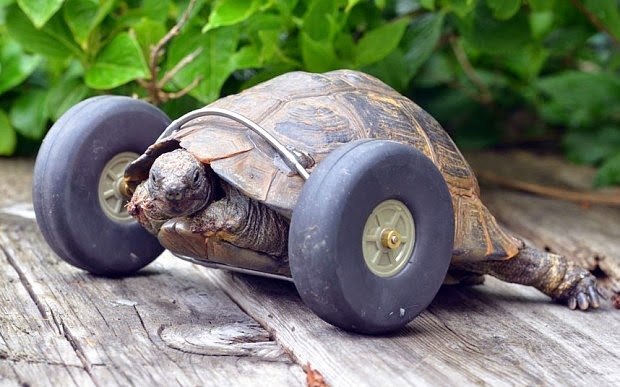 The animal, called Mrs T, was facing a grim future after a rat chewed off her two front legs while she was hibernating, but her owners glued the wheels from a model aircraft onto her shell. "It was like fitting her with a turbo charger - she's going double the speed she used to," said owner Jude Ryder. "She uses her back legs to push herself along. She seems quite happy, but it's difficult to tell with a tortoise." The 56-year-old was horrified when she went to check on her ancient pet last month and found her front legs had been eaten in the rat attack. Mrs Ryder said: "She took to them straight away, but she has had to learn how to turn and stop. She can get a good speed up, much faster than before. Mrs T is still quite young for a tortoise. She could go on for another 50 years - all she needs is a new set of tyres every now and again." Mrs T was in her 60s when she was bought as a pet for Dale when he was eight. It has the run of Mrs Ryder's garden in Pembroke, West Wales, in the spring and summer before being tucked away in in the garden shed to hibernate. Mrs Ryder said: "We were afraid she may have to be put down, but her new set of wheels have saved her life. She has the run of the garden again and we can always find her because she leaves very strange tracks behind wherever she goes." Responses to "90-Year-Old Tortoise Gets New Lease On Life From Incredibly Devoted Family (Video)"